Rock n' Roll Racing is an isometric racing game developed by Blizzard Entertainment and published by Interplay for the Sega Mega Drive. It was released in 1994, several months after the SNES version when Blizzard had changed their name from Silicon and Synapse. The game features a commentator, and much of its music is based on famous rock tracks. By entering a cheat code, it is possible to play as Olaf the Stout, a character in Blizzard's other game, The Lost Vikings. 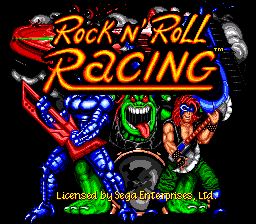 Rock n' Roll Racing was developed as a sequel to the Super NES game RPM Racing, though Blizzard dropped the idea of it being a direct sequel when the "rock n' roll" theme was brought in. A sequel, Rock & Roll Racing 2: Red Asphalt, was released for the Sony PlayStation. Main article: Rock n' Roll Racing/Magazine articles.